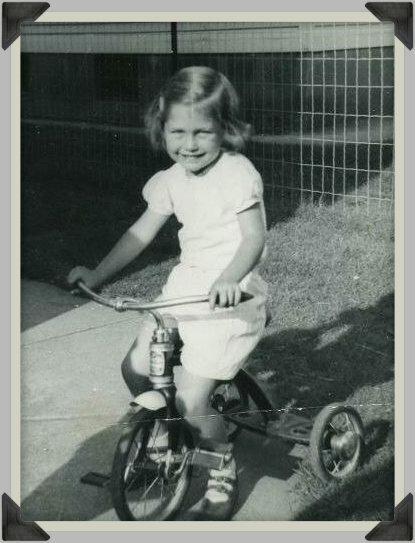 My sister Christine at four. Now on Medicare. Today is my oldest sister’s birthday. She’s now the magical Medicare number. She seems to be taking it pretty well. I, on the other hand, am taking it rather poorly. It’s unnerving to have a sister on Medicare. It’s okay for my Mom to be on Medicare. But my sister? Medicare has always been my euphemism for OLD. I tell myself that my sister is so much older than I. When I was born Christine was three-and-a-half going on forty. She was always so grown-up to me. My mother says she can hardly remember Christine as a baby. When Claudia was born, Mom called Christine from the hospital, and Chris, then fifteen months old, carried on a conversation and sang – “Somebody’s Coming To Our House” – a song my grandmother taught her about the new baby. In a family of smart people, my sister is brilliant. I don’t remember a report card that wasn’t all As, or a class ranking less than first. And unfortunately for Claudia and me, a teacher who didn’t wish we were a bit more Christine and a bit less “us”. Chris was a serious kid. She read constantly. I coveted the books she read, but she was adamant that her books were too ‘mature’ for me. That was all I needed to hear. I surreptitiously read whatever she left lying around. Paragraph by paragraph, I ‘snuck-read’ every book she had – whether I understood it or not. I read ‘The Member Of The Wedding” and “Catcher In The Rye'” five minutes at a time. Chris had a strict sense of Fairness, which included a list of privileges based on age. She relished the power of being the oldest. She especially demanded adherence to a hierarchy of bedtimes. She was the boss of us all, including, sometimes, my parents. Whereas Claudia devoted herself to making me laugh, Christine was more apt to make me cry. And I cried easily. And often. I don’t think I was much of a challenge for Christine. I don’t remember playing with her too much. Not without me running off in tears anyway. But I remember one day. We were playing with our paper dolls. We used to make paper dolls ourselves by cutting up the fashion photographs from an old Montgomery Ward catalog. Claudia had a paper doll that had a very serious expression. And I wet my pants. Happy Birthday, Chris. Thanks for making me laugh instead of cry. It’s wonderful having sisters. Congratulations to your (much) older sister! I never had a sister, but wish I had yours! It sounds like you guys had a great childhood. We had an ordinary, but extremely happy, childhood. Gosh, I wish I had an older sister. Happy Birthday to sinful Christine! In my family, I’m the older sister. Thanks to you and yours for making me laugh today. And happy birthday to Christine! I have a feeling your family has a lot to do with that wonderful sense of humor you have. This post is hilariously fun because it goes back to the honest feelings of a little girl. I was the big sister to my little brother – poor guy – and he too, was never old enough to share my special world. I am so happy we share the same world at last. Me too. As we grew up we all became great friends. Christine was even the maid of honor at my wedding. Happy Birthday to your much older sister. This cracked me up: “Oh wait, I have a blog. I brag to strangers every day as a hobby.” And remember, blogging is for the youngsters ONLY. 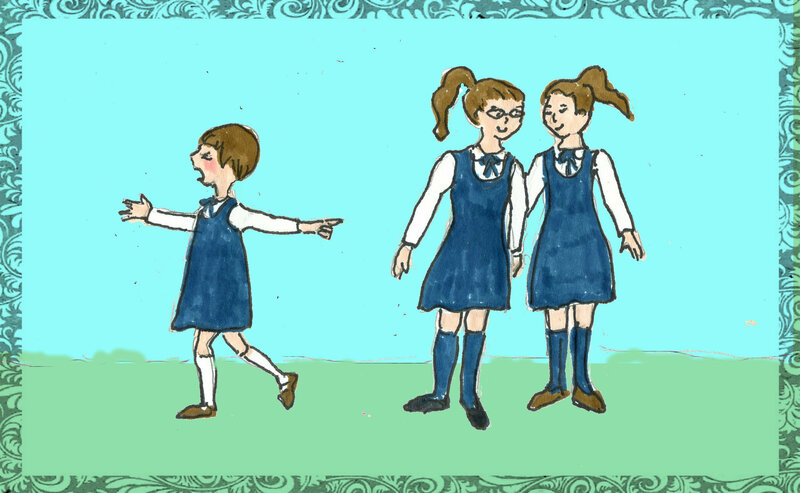 This is a different Chris – are those your St. Ann uniforms? Yes, Our navy blue St. Anne’s jumpers. I was so skinny that mine always hung loose. Yeah for older sisters! I hope she reads this and knows you love her. Yes she read it. She insists she’s only one day older than she was yesterday. (I figure that’s denial). And she admitted that I was almost too easy to torment. In fairness, she also said that the privileges of being the oldest were offset by having to take my baby brother with her when she went shopping with her girlfriends on Saturday. And she does know I love her. Sisters! I have several and most of them are older than me. It is funny as each of them reach a milestone age, when I look at them I still see them so much younger and I wonder how that is possible. I think of my sisters as young… but older than me, of course. My sis and I weren’t the best of friends, but now that we’re grown up, we love to play together. Same here. But the crazy thing is now that we are adults, we are eerily alike. Loved this description of your sisters and your relationships. I’ve got a year and a half before I am Medicare age. Sneaks up on you, doesn’t it! Big brother reached it this year. Happy Birthday to Christine. I was the oldest sister of five siblings. I HAD to set an example but I wasn’t as talented as your sister. Nice tribute. I have five sisters and I am the oldest.I just loved this post. Thanks… were you bossy too? I love the drawings that accompany your blogs. I love the one here of the three sisters. I cracked up when I read that Cynthia line.